Peppermint Patty is one in a trio of sisters rescued from living behind a fast food restaurant at a young age. 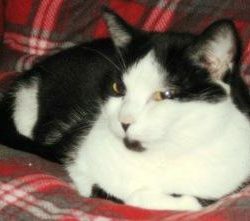 Peppermint Patty is a shy girl who has taken years to trust her foster mom. She will now let her foster mom pet her but no strangers allowed! She loves life in her foster home with her sisters.